A lot of my work looks at different perceptions of familiar, domestic or common experiences growing up in an Australian environment. I was looking at how the idea of the dog, something that is considered a much loved participant in family life, can become something dark and menacing depending on different cultural frameworks. Dogs are considered ritually unclean to Muslims, the traditional view is that they’re kept only in a practical capacity such as guard dogs. The area that I grew up in was filled with cheap car yards, mechanics and hock shops, most of the dogs that I encountered reinforced my distrust. The other side to this was the imposition of the supernatural within the natural world. Djinn are regarded as taking on the forms of dogs and snakes, black dogs in particular were to be avoided as they’re considered representatives of Satan. For a culture that doesn’t encourage imagery, illustrating evil with a living creature that you will encounter in your daily life orchestrates a terrifying experience. This work is about examining my own mythology, subverting cultural prohibitions and dragging my monsters into the daylight. 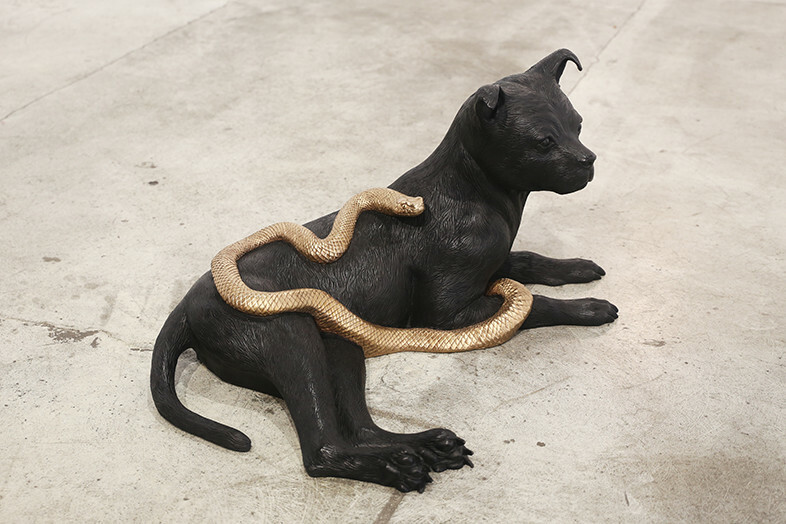 It’s a dog and a snake, it’s also a chasm of fear. Abdul-Rahman Abdullah is an Australian artist whose practice explores the different ways that memory can inhabit and emerge from familial space. Working primarily in sculpture and installation, Abdullah draws on passages of personal history, articulating formative experiences of individual identity within the broader scope of family. 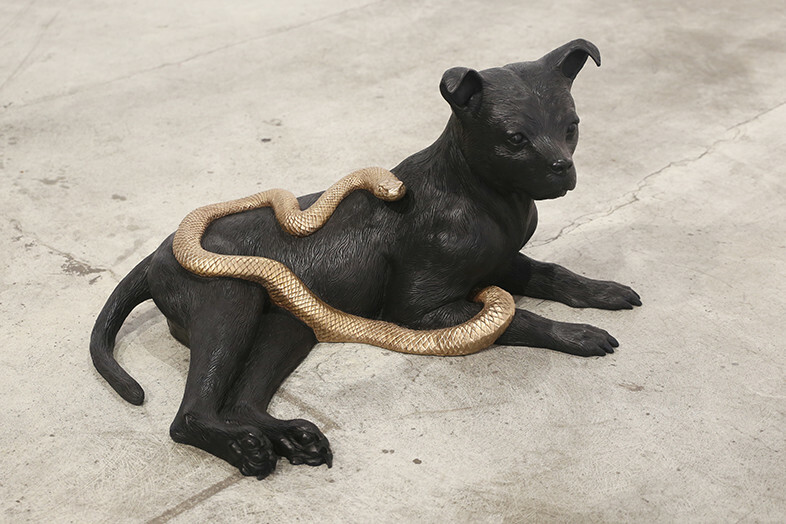 Expanding on the narrative capacity of animal archetypes, crafted objects and the human presence, his work is intended to create a physical dialogue between the natural world and the agency of culture. While his own experiences as a Muslim Australian of mixed cultural heritage provide a starting point, Abdullah negotiates shared understandings of individual identity and new mythologies emerging from a contemporary multicultural context. Abdullah graduated from Curtin University with a BFA in 2012 and in July 2017 he won the Pro Hart Outback Art Prize. His work has been exhibited widely, including the Art Gallery of South Australia, Art Gallery of New South Wales, Art Gallery of Western Australia, Perth Institute of Contemporary Art, South Australian Museum, West Space, John Curtin Gallery and the Australian Centre for Contemporary Art. Abdullah is held in the collections of Artbank, Islamic Museum of Australia, Campbelltown Art Centre, Murdoch University, University of Western Australia, Curtin University, Wesfarmers, City of Broken Hill, Art Gallery of South Australia and Art Gallery of Western Australia.